Adam Haseley was a dual threat at the University of Virginia. As a freshman in 2015, he started 62 games in the outfield for the Cavaliers and made 11 appearances on the mound, working five scoreless innings in game two of the College World Series finals. He went on to post the ninth-best ERA nationally the next year at 1.73, while batting .304 in 60 games. "I would probably categorize it as not overpowering," Haseley says of his repertoire as a pitcher. "I thought I threw strikes pretty well, ate up innings, and at UVA for a year or two we didn't have a surplus of pitchers, so they just kind of asked me to be in that role, and that's what I was doing for a couple years." The Windermere, Florida, native juggled both roles effectively while majoring in Religious Studies at Virginia, emerging as a Louisville Slugger Freshman All-American. "It was honestly pretty tough my first year," Haseley says. "The first time of being in class, and doing both pitching and hitting; it's a little easier in high school, just because you're not playing four times a week, you're playing once or twice. So it was tough that first year for sure, but I got used to it, started learning what worked well for me schedule-wise, so it got better the last two years." Haseley did not only manage it, he flourished in both areas. Heading into 2017, Haseley maintained his role as a top two-way player, but focus began shifting to his ability as an offensive prospect as time turned toward the MLB First Year Player Draft. "I played in the Cape Cod league the summer before and just hit, so that was a good introduction to just hitting and focusing on outfield every day, playing everyday," Haseley says. That season was his breakout moment, as Haseley's .390 average ranked 11th nationally, launching him to first-round status. The Phillies drafted the now 22-year-old eighth overall in June last summer. "I think it might have taken some people by surprise," Haseley says of his offensive outpouring during his junior year. "I certainly wasn't going into the season thinking I was going to have that kind of success, but I just kind of stuck with what I was doing well, and tried to keep it going." 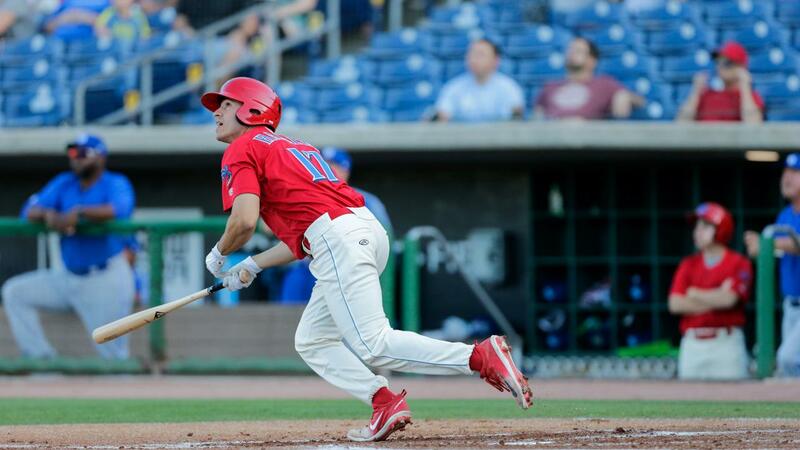 Haseley made his professional debut in the Gulf Coast League on June 27 last year, and climbed two levels over the next two months before winding up with the Lakewood Blue Claws to finish off the season. The 6'1" outfielder made a quick splash in Clearwater this year, launching a game-tying, three-run home run in the sixth inning on Opening Night. That home run punctuated an eight-pitch battle, reflecting a common theme in Haseley's approach. "I think for any hitter, when you're swinging at the right pitches, you're going to have success," Haseley says. "So that's what I strive to do, be patient and try to work counts to where they're favorable for me, and I get a good pitch to swing at." Haseley's approach tends toward the old-school, in the age of launch angles where emphasis on home runs sometimes outweighs the line-drive, all-fields approach. "I think if you have a good swing, and you prioritize swinging at a good pitch, you'll have a good launch angle," Haseley says. "I think sometimes guys form their swings to try to create fly balls and stuff like that. I think it has to be a balance of having a good swing, which is obviously able to drive the ball, and then also swinging at a good pitch. So it's a combination of both for me." Haseley has shown the ability to use all fields - of his first seven hits, three had gone the opposite way, three to the pull side, and one up the middle - with a line-drive swing. "I was never taught to lift the ball, or try to hit fly balls," Haseley says. "Definitely line drives have always been something that was preached to me. "I still think, 'drive the ball,' but I think you can kind of get in trouble when you start purposely trying to lift the ball." With a vast collection of video and advanced statistics now made available throughout professional baseball, Haseley is working to keep it simple, and stay true to himself. "Just consistency in your swing, and not trying to get too involved with video and trying to be someone that you're not," Haseley says. Haseley says that he does utilize video when things are going well at the plate, in attempt to emphasize mechanics that have worked. "I like to watch the good video. I know some guys kind of watch both, which is fine, I think you can fix things if you watch it. "I like to reinforce the good things."